Castor, and its pending redelivery by the salvors to its owners for repair, a 39-day saga that has involved eight nations and raised serious concerns within the mar- itime industry has been successfully concluded. "It is unfortunate that political inter- vention into what should have been a purely technical challenge, put so many elements at risk," said Nicolas Hondos, chief executive of Athenian Sea Carri- ers, owners of the Castor. While the states refusing admission claimed an imminent hazard, indepen- dent scientific analysis of both scenarios clearly showed that the risk of an explo- sion was minimal and that the potential pollution threat was far worse if the ves- sel was to sink in deep water. ABS, the classification society of record for the Castor stressed the difference between a damaged vessel and one that is substandard. "Since suffering the ini- tial heavy weather damage this vessel has been subjected to an extreme Force 12 gale with wave heights in excess of 8 meters without any further deterioration in its structural condition," Robert D.
George Tsavliris, a principal in the sal- vage firm Tsavliris Towage & Salvage. "The allegations regarding the condition of the vessel were completely without foundation." From a technical point of view the cargo transfer should have been a straightforward operation. "Given the traditional maritime courtesy of access to a sheltered area, this incident would have been over within three days,"
Secretary general William O'Neil is to be applauded for his swift response in placing this issue on the organization's future agenda," said Somerville. That means boats must run faster, more reliably, more economically, with more control. 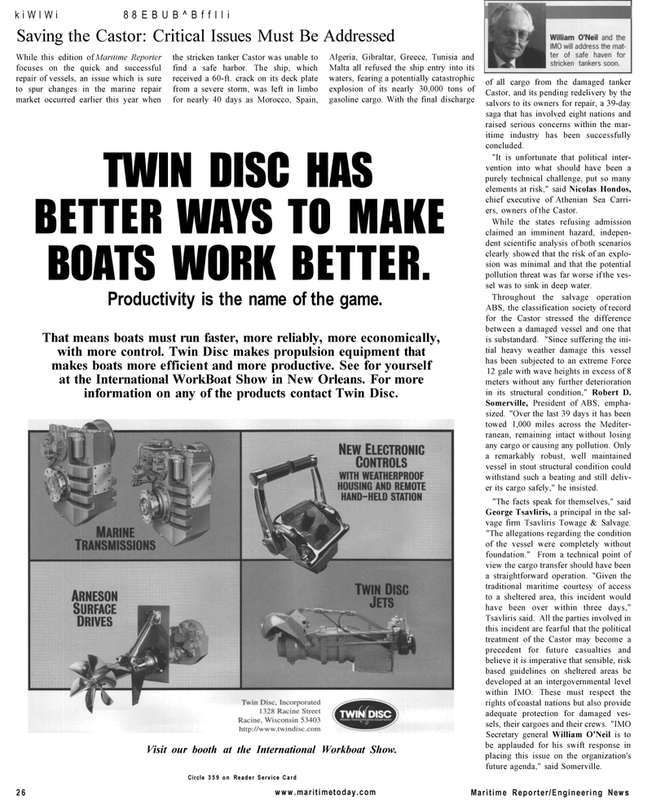 Twin Disc makes propulsion equipment that makes boats more efficient and more productive. See for yourself at the International WorkBoat Show in New Orleans. For more information on any of the products contact Twin Disc. Visit our booth at the International Workboat Show.